We are pleased to announce the release of NetWrix Event Log Manager 4.0 – a brand new version with important new features as syslog events (Unix and Linux support), improved event collection and reporting and many other features. 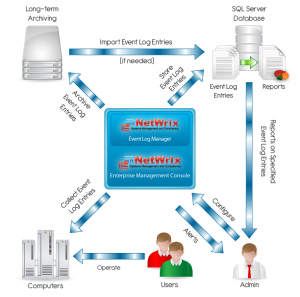 NetWrix Event Log Manager is an event log consolidation, alerting and archiving tool that allows collecting event logs from multiple computers across the network, alerting on most critical events and centrally storing all events in a compressed format that enables convenient analysis of archived event log data. Support of syslog event collection. Predefined events collection rules are available for Ubuntu 11 and RedHat Linux 5. New choice options for monitored computers: from within an IP range or by importing computers’ list from a file. The new Subscription feature allows scheduling any available reports for automatic delivery by specifying report filters, schedule (daily/weekly/monthly) and recipients. 30 new reports have been added. New option allowing to collect and archive important events only. Predefined sets of audit archiving filters are available for the following regulatory compliances: GLBA, HIPAA, PCI, SOX. New option to collect detailed event descriptions and include them in reports.